The Obama Administration is losing the ally of Egypt in the Middle East due to its policies according to senior Egyptian officials. This flies in the face of what media reports about how Obama is doing overseas. The media wants the American citizens to believe that Obama’s policies are making a safer world. In fact its the opposite, the policies are making the world more dangerous, especially for Americans. A day after President Obama made another stupid statement, the White house press secretary, Josh Earnest, had to come out and ‘clarify’ the statement. It becomes difficult when Obama’s statement was extremely broad. It seems like everyone misunderstood what the President meant. According to Earnest the President was only referring to ISIS in Syria. But because the President was not clear, the media, and the world, took off with his statement. Anyone who is not familiar with history, on November 9-10, 1938, Jews throughout Germany and in part of Austria were targeted in a coordinated attack. Jewish owned buildings were damaged, Jewish owned businesses were destroyed, and synagogues were burned, damaged or destroyed. 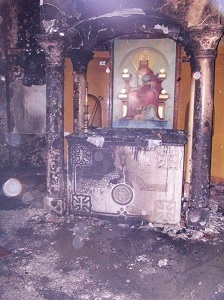 Outrage Over Churches Attacked in Egypt? I always hear how non-violent and peaceful the Islamic religion is. I am told this by many on the left and by many Muslims themselves. However, history and recent actions shows a different story. Anyone who looks at the history of the Middle East sees conflict, and that does not even take into account religion. The recent actions in Egypt, and the Western media ignorance recently concerns me. It takes only a quick Google (or Bing depending on what you use) search to find the truth. If you are Christian in Egypt, you are not safe.